Salt Lake City, UT – Sierra Designs has released a trio of new jackets filled with lofty 800-fill goose down perfect for anything from a cozy mid-layer to expedition-level warmth. New for fall 2010, the Manic Hoody is Sierra Designs’ warmest down jacket. Our test samples of these three new jackets arrived just in time as the season’s first deep freeze descended upon Utah. The temperature was -12ºF in the Wasatch Mountains as we headed uphill in Sierra Designs’ Manic Down Hoody ($239), and it was as warm as a furnace. Complete with a polyester ripstop shell that SD has named “Elevation” and a polyester taffeta lining, this piece weighs in at 21.5 oz. and would be at home in winter base camp as it was on the ski hill. Three exterior, two zippered interior and one large drop pocket big enough for a Nalgene bottle keep items neatly organized. A Cire coating helps to repel water to maintain the insulating qualities of the down filling when things get a little damp but this jacket’s not about repelling weather, it’s all about repelling cold. The generous insulated hood is large enough to accommodate a ski or climbing helmet. While the cinch-cord hem and Velcro wrist closures kept the drafts out, however, the neckline was drafty without a closure. For the life of us we can’t fathom why SD chose to eschew a cinch cord around the neck, but a simple neck gaitor effectively closed the gap. When contacted with our concerns, the company’s product designers indicate that they agree and plan to add such a closure to the Manic. And at $239, Sierra Designs has found an enviable price point for a jacket stuffed to the seams with so much high quality down. 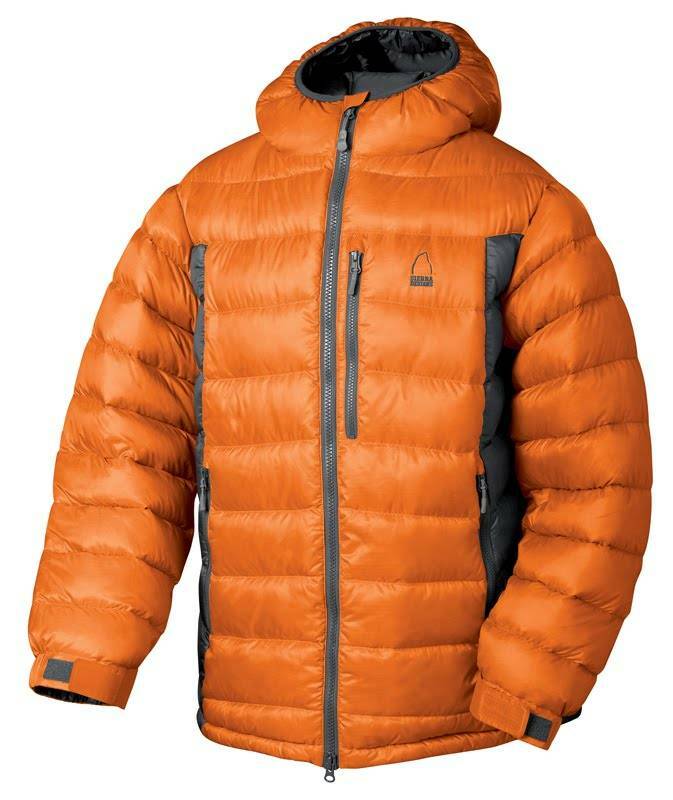 The new Gnar down jacket from Sierra Designs is also offered as a hoody. SD’s other two new down jackets differ only in the hood. The Gnar comes as either a jacket ($199, 11 oz.) or a hoody ($209, 11.5 oz. 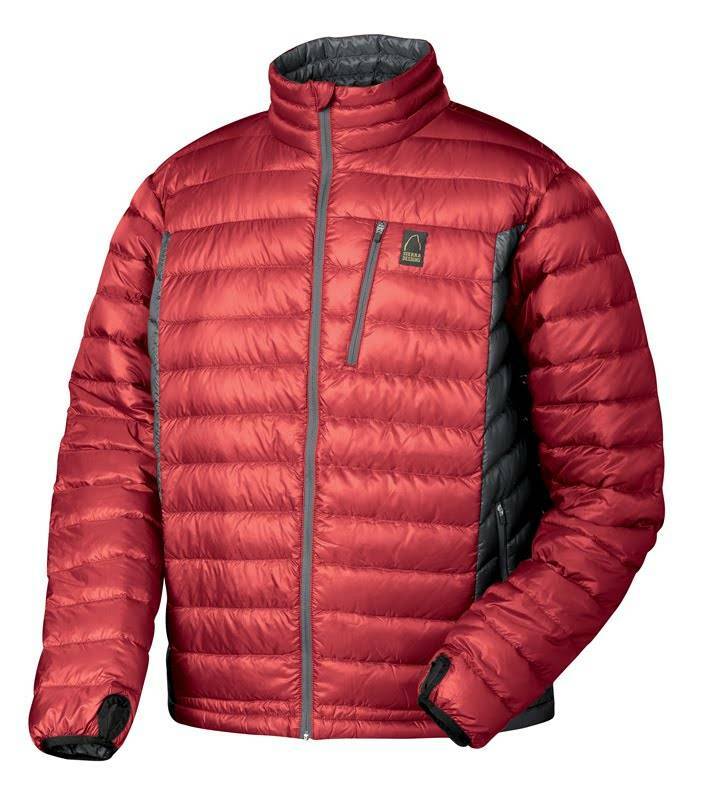 ), either of which make a terrific insulating mid-layer or as a jacket for frosty autumn mornings around town or standing at the end of a belay rope. They have one exterior chest pocket, one interior zippered pocket and two large drop pockets inside. Thumb holes help to keep hands toasty and the jacket’s wrist in place. A DWR finish repels water from the nylon ripstop shell. We found the construction on all three pieces to be top shelf. 800-fill down compresses like nothing else, and all three pieces come with matching stuff sacks, a nice touch for tossing the jacket into a backpack when conditions warm during the day.